This is my bike, a folding Montague (from when they were still co-branding with Schwinn). She’s one of three, usually found dangling on our hangar wall, in the baggage compartment of our plane or tooling around one of the Lake Erie islands. However, this year, she’s going on a bike tour — her first, though not mine. In the past I’ve ridden my road bike (a pink Bianchi Eros also from the early 90s that I call Petunia), but this tour is on rail-trails and they recommend using a hybrid. Don’t get me wrong. I love my Montague. And don’t even start about the wastefulness of owning two bikes. I know it’s seems extravagant, but the Montague is so heavy, especially when you pack on all the gear I like to take on long rides. Besides, if you know anything about me, you know I never pay full price for anything. The pair of them probably cost less than your two wheeler (and what an expression that is — takes me right back to second grade). Still, what doesn’t kill me makes me stronger and all that, right? I’ve grown resigned to the idea of lugging my weighty black bike around the trails of West Virginia, Pennsylvania and Maryland. (For details on the tour — which is going to be awesome, by the way — go here: http://tinyurl.com/my692xa). But the Montague didn’t have a name. I don’t know why it’s so important to me — I certainly don’t normally name inanimate objects (well, except for my bikes and maybe the plane) — but it feels wrong to go on a journey of over two hundred miles together and not be on a first name basis. I’ve tried for years to think of one, but none of my ideas felt quite right. Finally, in desperation, I posted my dilemma on Facebook. Within seconds, I had received a suggestion for the perfect name. Stella. Perfect because it means star, and she is a star, and also because Stella is one of my family nicknames. And Ivy, from Darling Daughter. Perfect because it’s a plant, like Petunia, my other bike. And also green, like the trim on Stella. Stella Ivy sounds good, right? Well, how could I say no? Stella Ivy Eleanor Montague. Fair enough. I have four names. Why shouldn’t my bike? Then another friend mentioned Juliet — to go with the Montague, you see. It sounds crazy, but now I feel like we’re a team, Stella Ivy Eleanor Juliet Montague and me, ready to hit the rail-trails. Now here’s the part where I make this story have something to do with reading or writing. In writing, you see, as in bicycle naming, sometimes you need a little help from your friends. An example: On my current WIP, my heroine has to see her father doing something with a woman who isn’t the heroine’s mother. It had to be bad enough to make the heroine not speak to him for several years, but not bad enough to make him irredeemable. At first, I had the heroine — let’s call her Holly — catch her dad kissing another woman, until a friend pointed out a kiss was too minor a transgression for Holly to react so strongly. It made Holly seem like a priss, which she is to some extent, and yet, she still had to be likeable. I changed the scene to have Holly catch Dad with his hand down the other woman’s blouse. That didn’t feel right either. Too sleazy. Now, I’m not saying your friends can write your story for you, or that they’ll always have the answers (or even bike names), but what they can do is get you thinking in different ways so you can solve the problem. Or so says Stella Ivy Eleanor Juliet Montague. Addendum: By the time you read this, I’ll be on the tour. Wish me luck! 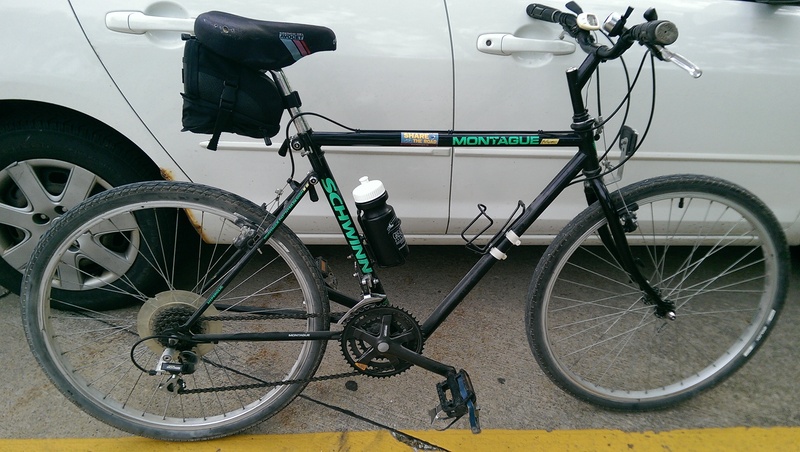 This entry was posted in Rave, Writing and tagged Bike names, critique partners in writing, folding bicycle, Folding Montague bicycle, Help from friends, Montague bicycle, Writing, writing help. Bookmark the permalink. Be safe. May Stella Ivy Eleanor Juliet Montague be up to the task of bringing you home in one piece. Good Luck for excellent weather. Have a great time! Looking forward to hearing about your adventures when you get back. Thanks, Lynne. It was good. I found it challenging but rewarding. And what a beautiful set of trails.